Smoke the Fat – Weight Loss Guide – Page 4 – To change lives by helping people lose weight in a caring environment. 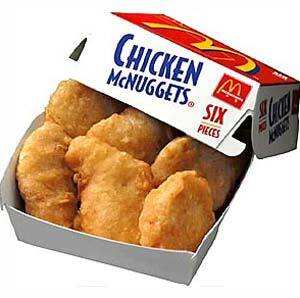 McDonalds chicken nuggets are a favorite with children in many families. Parents buy the ‘chicken nuggets’ believing they are indeed made from just chicken. McDonalds even provides flyers titled “A Full Serving of Nutrition Facts: Choose the Best Meal for You.” However as you can see from the ingredient list below, there is a lot more than just chicken. Chicken, water, salt, modified cornstarch, sodium phosphates, chicken broth powder (chicken broth, salt, and natural flavoring (chicken source)), seasoning (vegetable oil, extracts of rosemary, mono, di- and triglycerides, lecithin). Battered and breaded with water, enriched bleached wheat flour (niacin, iron, thiamine mononitrate, riboflavin, folic acid), yellow corn flour, bleached wheat flour, modified corn starch, salt, leavening (baking soda, sodium acid pyrophosphate, sodium aluminum phosphate, monocalcium phosphate, calcium lactate), spices, wheat starch, dried whey, corn starch. Batter set in vegetable shortening. Cooked in partially hydrogenated vegetable oils, (may contain partially hydrogenated soybean oil and/or partially hydrogenated corn oil and/or partially hydrogenated canola oil and/or cottonseed oil and/or sunflower oil and/or corn oil). TBHQ and citric acid added to help preserve freshness. Dimethylpolysiloxane added as an anti-foaming agent. There are 38 ingredients in a McNugget; many of them made from corn. Further down the list there are the mono, diandtriglycerides, and the emulsifiers that keep the fats and the water from separating. More corn flour is used to make the batter, and the hydrogenated oil in which the nuggets are fried can come from soybeans, canola or cottonseed, depending on the market price. It gets worse: a number of the ingredients come from petroleum products, to keep the items from spoiling or ‘looking strange’ after months in the freezer or on the road. If you are truly worried, look up these ingredients: sodium aluminum phosphate; mono-calcium phosphate, sodium acid pyrophosphate, and calcium lactate. These are used to keep the animal and vegetable fats from turning rancid. Then there are “anti foaming” agents like dimethylpolysiloxene. According to the Handbook of Food Additives, this material is a suspected carcinogen and an established mutagen, tumorigenic, and reproductive effector. It is also flammable. The most alarming ingredient in Chicken McNuggets is “tertiary butyl hydroquinone,” or TBHQ, derived from petroleum. This is sprayed directly on the nugget or the inside of the box it comes in to “help preserve freshness.” Again, according to A Consumer’s Dictionary of Food Additives, TBHQ is a form of butane (lighter fluid) the FDA allows processors to use sparingly in our food. It can comprise no more than 0.02 percent of the oil in a nugget. Which is probably just as well, considering that ingesting a single gram of TBHQ can cause “nausea, vomiting, ringing in the ears, delirium, a sense of suffocation, and collapse.” Ingesting five grams can be fatal. Do you really want to give your kids Chicken McNuggets? For years we’ve been told to drink 8 glasses of water per day for optimum hydration, but that has since been proven to be an unreliable number. Natural health experts now recommend drinking half your body weight in ounces of water per day. If you’re 200 pounds, you should be drinking 100 ounces of water per day! That’s almost 3 litres or the better part of a gallon of water. I’ve told friends and clients for years that it’s not the amount of water you drink that matters, but rather the amount of water that actually makes it to your cells that matters. What that means is that if the conditions are not right inside your body, any water you drink may simply pass right through. Want to improve your water absorption? read this article. I make it a point to be very conscious about the amount of water I drink. Water is critical to so very many functions in the human body, and given the amount of training I do, I’m drinking even more water to account for water lost during sweat and other exertion. I’ve always thought that I’ve been very aware of how much I’ve been drinking, but a recent body composition analysis told me that I was dehydrated. You’ve GOT to be kidding me. I tend to piss people off because I keep talking about water all the time and encouraging them to drink more, and now I’ve found that I’m not drinking enough water. That got my attention very quickly. So what are the right conditions then, and how do we improve them and increase the absorption rate of the water we’re drinking? Great question. Without getting into a huge amount of detail about it, lets just say that there are a lot of minerals involved in an ideal balanced blood chemistry for human health. Our hunter gather ancestors got on average, 11,000 mg of potassium per day and 700 mg of sodium. That’s a a ratio of almost 16:1. They acheived that by consuming a diet super rich in plants, fruits, nuts and seeds. Compare that to today’s average intakes of 2500mg and 7000mg or a ratio of (nearly) 1:3 potassium to sodium. So, based on our origins, the natural approach to increasing water absorption is based on our diet and that being, a diet rich in vegetables, fruits, nuts and seeds and completely excluding any additional salt. 1. Eliminate all additional salt in your diet – DO NOT add salt to anything. 2. Increase your vegetables, nuts and seed consumption – with an emphasis on dark leafy greens such as Swiss chard, collards, mustard greens, spinach. This will increase potassium in your diet as well as amounts of fiber. 3. Eat Chia Seeds – Chia seeds absorb 12 times their weight in water. In addition to being a fantastic source of fiber and Omega 3’s, Chia absorbs water and carries it into the colon where it can be passed along into the body at a slower rate. Instead of drinking water and hoping some of it is absorbed, eating your water can be a way to slow the process down and allow it a timed release. Much like timed release of vitamins, you can time release your water. Chia seeds are an amazing food and part of my Desert Island Foods. 4. Supplement with Glutamine – Glutamine is one of the most over looked and under used weight loss supplements I’ve ever seen. It’s used by every cell of the body for energy, immune system function and as craving control for both carbohydrates and alcohol. Where water intake is concerned, glutamine improves water uptake into the cells because it depends on sodium for transport. Glutamine is one of the amino acids that controls the volume of water in the cells and osmotic pressure in other tissues. In layman terms, what that means is that glutamine plays a role in the ability of water to cross from the bloodstream into the cells and vice versa. The side bonus of this is that glutamine also plays a role in the cells ability to release toxins and molecular garbage. Glutamine plays a role in detoxification (in which water plays a highly important part as well). Water is used in many ways in the body. We retain water if we don’t drink enough and if our sodium potassium ratio is off. If we’re not allowing water into the cell, we’re not allowing wastes out of the cell either and that most certainly is not healthy. The additional benefits of the four approaches above is that we should release some retained water, allow our body to clean itself, improve our energy levels, improve our mood and become more regular at the same time. Water is critical to health. By improving the quality of our water as well as our ability to improve the absorption of the water we do drink, we improve how we look and how we feel. As we attempt to cope and deal with the pressures in our lives, alcohol consumption is becoming too much of the norm. We release our stress sometimes via an alcoholic beverage or two without thinking about the cause and effect it can have on your waist line, appetite and overall health. I am not here to bash having a drink or two, but I am going to encourage anyone who wants to lose body fat to rethink their drinking habits. First and foremost, alcohol is a poison and your body must fight to get it out of your system. It directly impairs liver function thus severely hampering your metabolism of fat. If fat loss is your main goal moderation is a key. I have trained many adults who like there nightly beverage, but they never or rarely lose body fat. I would suggest limiting alcohol consumption to once a week if fat loss is your goal. When your liver is processing alcohol it will stop all other metabolic functions. It will do so until it rids your body of ethanol toxicity which is the by product of alcoholic consumption. This process leads many times to stubborn fat, high cholesterol, high blood pressure and syndrome X. Drinking in excess will also contribute to fat gain not loss. If you think you are going to gain muscle mass while drinking think again! Your liver is to0 busy doing something it does not want to do, process alcohol instead of amino acids. In addition, alcohol reduces testosterone. 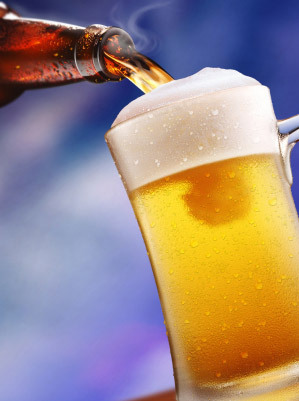 We have not even touched on how many extra calories alcohol consumption can add to your daily caloric intake. As my good friend Tom Venuto states, “Those calories add up so quickly.” Think about how much you consume and the caloric value of each drink. Alcohol contains 7 calories per gram. This is almost twice that of carbohydrates and protein and just under the 9 grams per calorie for fat. Here is an example: consuming 2-3 drinks a day can add up to over 400 calories extra each and every day. Multiply that by one week and you are over 2700 calories extra. That is over a half a pound. Another item I have learned from Tom Venuto was the simple but often overlooked factor that by doing something everyday becomes habit-forming behavior. The daily routine of consuming an innocent evening drink will lead to the ill affects of alcohol consumption. Consuming alcohol again stops all fat burning, adds extra calories, increases estrogen level (stubborn fat), increases appetite and makes you more easily persuaded to eat that entire cheese cake. There are some simple guidelines you can follow that will not only help you stay on the fat burning path, but will encourage better overall health. Drinking red wine is much better for you then drinking beer. Red wine contains some good things that can benefit your health. On the other hand consuming beer, which contains hops and are highly estrogenic, will lead to more fat gain and harder fat loss. Try to stay away from extra sweet drinks with added sugars. This will keep your blood sugar from a massive spike while having a drink. Have you ever wondered why are these drinks are so popular? I would highly suggest that you read my stubborn fat solutions report (If you think you have stubborn fat) and to avoid alcohol for at least two weeks while your detoxify your liver and get started on a friendly fat burning environment. Follow the European model; eat some fat or protein with your wine. The more food you have in your belly the slower the absorption. It also aids in insulin regulation. Avoid high carbohydrates snack with alcohol. It carries many metabolic problems like insulin elevation and high fat levels in your blood stream. In summary, I would suggest eating an anti-estrogenic, well- balanced diet and minimize alcohol consumption until you reach your fat loss goals. This will also aid in your quest for a set of six pack abs. The Best Way To Lose Weight Quick At House – Is It Potential? The largest impediment faced by overweight folks is where to exercise. You’ll have taken a fitness center membership in all enthusiasm and lost your nerve when you reached there. You might have felt intimidated seeing so many fit and attractive people. You might need even felt discouraged seeing them sweat over the equipment. You would like to learn how to lose weight fast at home so that you could get your weight reduction started in the privacy of your 4 walls. How to shed twenty Lbs in a couple weeks is a challenging request. To make it happen you have to hit an ideal balance of eating habits, exercise, and sleep. Today we are going to look at how Asian Women seem to drop fat so rapidly, including following childbirth, and ways you can utilize these same tricks and tips to get thin fast.